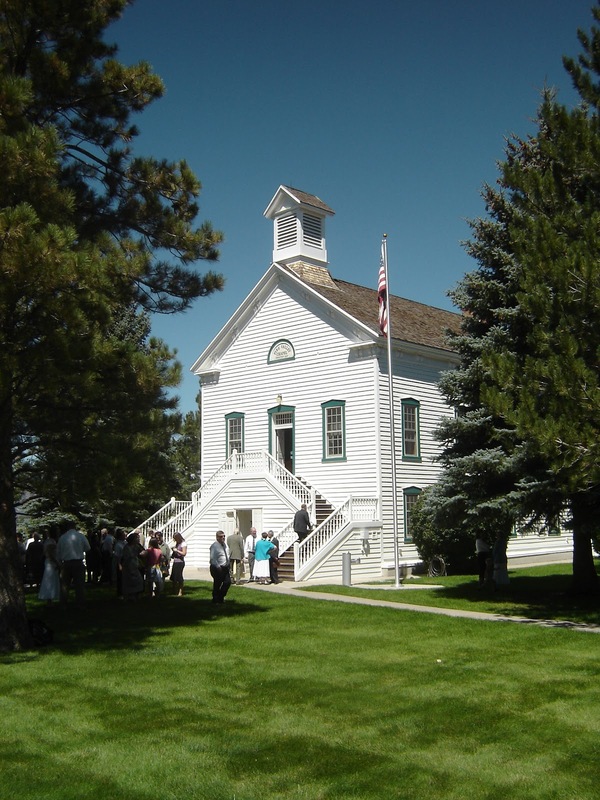 When we visited St. George in 2008, we vowed that we would attend our church meetings at the Pine Valley chapel the next time we came. It’s been four years since we visited southwestern Utah as a family, and we kept our vow today. There stretching before me was the most beautiful sight I had ever beheld on God’s green earth. Soon a saw mill was erected. In 1868, this chapel, one of the longest in continuous operation by the Church, was dedicated. Lumber was taken from the valley near that time and hauled north to Salt Lake City to build pipes for the Tabernacle organ. The little chapel on the upper story could not hold all the visitors they had today, so we sat on folding chairs on the lawn on the west side of the building, and watched fast and testimony meeting on a flat-screen TV. It was the first time I remember taking the sacrament under the shade of a pine tree. One woman who bore her testimony told of her mother who had died earlier this year at age 102 (the woman herself was 84!). She said that she died with a current temple recommend. When her sister went to close her mother’s bank account, she had one dollar left. Then the woman asked a pointed question: what will be of greater worth when you die, a full bank account with no recommend, or an empty bank account, a current recommend, and covenants made and kept. Got me thinking. There was a remarkable peace in our meetings today. And a great spirit of reverence. A spirit of unity among strangers. The spirit of Christ. I was deeply moved just being there. If you are ever in the St. George area over a Sunday, and you want a spiritual treat, visit the Pine Valley Branch in Pine Valley, Utah. You’ll have an unforgettable experience.